Part 1 The auditing process: Food standards and auditing; What auditors look for: A retailer’s perspective; Regulatory verification of safety and quality control systems in the food industry. Part 2 Safety and quality: Assessing supplier HACCP systems: A retailer’s perspective; TQM systems; Auditing HACCP-based quality systems; Laboratories and analytical methods: Quality control. Part 3 Other types of audit: Benchmarking; Environmental audits: Food processing and life cycle assessment; Auditing organic food processors. The food industry faces an unprecedented level of scrutiny. Consumers are not only concerned with the safety and quality of food products but also the way in which they are produced. At the same time the food industry has developed new ways of assuring appropriate standards for its products and their methods of production, developing systems such as TQM and HACCP to identify and manage key steps in production. These new methods require new skills in auditing. Auditing in the food industry provides an authoritative guide to the range of standards and the auditing skills they demand. Part one sets the scene with an introductory chapter reviewing developments in standards affecting the food industry. There then follows chapters on how retailers audit their suppliers and how governments have moved from a traditional inspection role to one of 'regulatory verification' with its emphasis on auditing the robustness of a business's own systems for managing safety and quality. Part two examines the key aspects of safety and quality. A first chapter reviews the ways retailers assess supplier HACCP systems. There is then a chapter reviewing TQM systems that provides a context for a discussion of auditing techniques for HACCP-based quality systems. A final chapter looks at standards governing the analytical methods used in safety and quality control. Part three considers newer standards that are becoming increasingly important in the food industry. 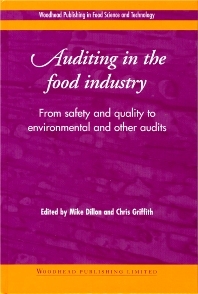 There are chapters on benchmarking an organisation against others as a way of improving performance, auditing the impact of food processing operations on the environment and auditing organic food processing. Auditing in the food industry is a valuable guide to the range of standards facing the food industry and the ways it can audit, and thus improve the quality of its performance. Mike Dillon is an internationally recognised authority on food quality and safety systems. A qualified auditor, he has developed training programmes on auditing and advised many leading companies. He has also written well-known guides to HACCP systems and auditing skills. Dr Chris Griffith is Head of the Food Safety Research Group at the University of Wales Institute, Cardiff, and a well-known authority on food safety management.